Do we clean a snake bite wound? You are out bush-walking with your friend. While walking along the tract your friend accidentally steps on a snake that rears up and bites her on the leg before slithering off. You have your snake bite kit with you. What should you do to the bite wound? Option 2 – Ask her to sit and stop moving. Call for help. Keep her pants leg down, leave the bite as is and apply a tight bandage to the area. If you answered Option 2: Ask her to sit and stop moving. Call for help. Keep her pants leg down, leave the bite as is and apply a tight bandage to the area then you would be correct! Australia is home to some of the deadliest snakes in the world. Lucky us right? The good news is that in most cases our slithering friends don’t really seek out humans to hurt them, we are more likely to encounter them by accidentally crossing paths. I am no snake-ologist or herpetologist so I would be useless at identifying snakes and which one is venomous and which one wasn’t. Therefore, if you are similar to me, you would treat every snake bite as if they were venomous until you are told otherwise by a professional. More good news, not all venomous snakes release venom when they bite. Snakes are smart and they know that they couldn’t possibly eat a human, so they save their venom for a tasty animal more suitable to eat. In order to conserve their venom but still remain threatening some snakes dry-bite, meaning they bite without releasing venom. Unfortunately, we don’t know if the venom was released or not so we always treat the bite as containing venom. This week’s trivia question centers around do we clean the bite to stop venom from spreading or do we leave the bite intact? To answer this question we need to understand how venom effects us. Snake venom can be fatal to humans when it enters our blood stream and it can also cause a lot of tissue damage around the bite. Contrary to popular belief, most snake bites occur in muscle tissue and not directly into a vein or artery. When the venom is injected into the muscle it moves into our lymphatic system. Our lymphatic system doesn’t have its own pump to move the fluid around, instead, it moves fluid around with the assistance of our muscles. The only way for the venom to spread around our body and into our blood stream would be from movement of our muscles. This is why the first part of snake bite first aid is to sit or lie the casualty down in a safe area and stop them from moving, even the movement of trying to roll up their pants leg to expose the wound could involve too much movement so it is recommended to leave clothing as is and to not expose the wound. Cleaning a snake bite wound is not recommended because when the casualty arrives at a clinic or hospital a swab of the skin/bandages can be used with a snake bite identification kit to identify the species of snake and and appropriate antivenom (if required) can be administered. After we have the casualty siting or laying down in a safe area, we call for help and apply a Pressure Immobilising bandage. 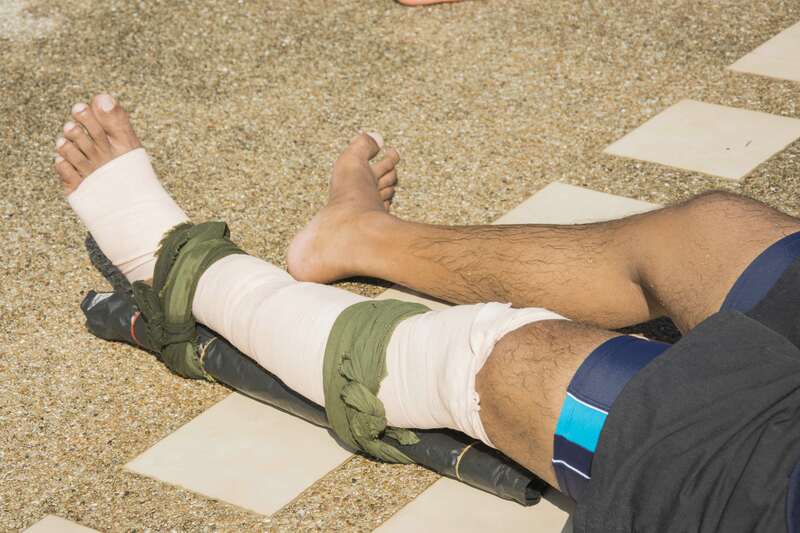 The first tight pressure bandage is applied to prevent lymph drainage from leaving the effected limb, the immobilisation is to prevent the skeletal muscles from pumping the lymph out of the effected limb. So to summerise, no cleaning is required for a snake bite wound, keep still, call for help and apply a pressure bandage and immobilise the effected limb.